Adding individuals to the Blocked list will prevent them from contacting an iOS user across multiple devices. The feature stops blocked persons from establishing contact via phone call, iMessage, and FaceTime chat. The Blocked list is accessible through the settings menu. 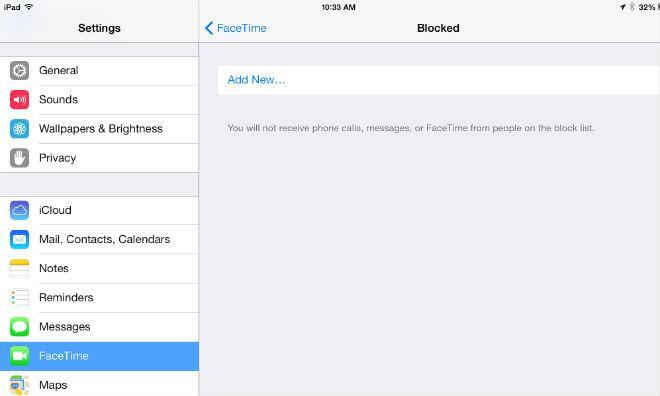 On the iPhone, users can access the blocking feature through Phone, Messages, and FaceTime settings. On the iPad and iPod, the blocking feature is accessible through the Messages and FaceTime settings menus. Blocking a person through any one of these menus will block them across all means of contact and across all of a user's connected iOS devices. Adding a person to the Blocked list is rather straightforward, assuming that person is already within one's contact list. After navigating to the Blocked menu, a user simply taps "Add New..." and the user's contact list appears. Tapping a contact's name automatically adds them to the Blocked list, severing all iOS ties immediately. Users can also add individuals to the Blocked list directly from the Phone, FaceTime, and Messages apps. In the Phone or FaceTime app, tap the Info button next to the name or number to be blocked and scroll to the bottom of the card to tap Block This Caller, and confirm the block. A user can also do so by going to the Contacts section under in the FaceTime or Phone app, scrolling to the bottom of a card, and tapping Block this Caller. In the Messages app, a user can tap the message from the individual to be blocked, tap Contact in the upper right corner, and then tap the Info button under the Done button. Upon scrolling to the bottom of the Info card, the user will see the Block this Caller option. In AppleInsider's tests of the feature, blocking an individual on an iPhone almost instantly added them to the blocked list on an iPad mini, and vice versa. Placing a call from a number that has been blocked will result in that call being forwarded to voicemail. Reversing an unintentional block is also straightforward. Much in the same way one might delete an email or iMessage, a user can just swipe a contact's name to the left, whereupon an Unblock option will appear in red. Tapping that option will remove the contact from the Block list across all devices within seconds. For more information on Apple's latest mobile operating system, visit AppleInsider's ongoing iOS 7 Feature Focus series. Other topics include in-depth looks at AirDrop, blocking individual cell numbers and the revamped Camera app, among others.